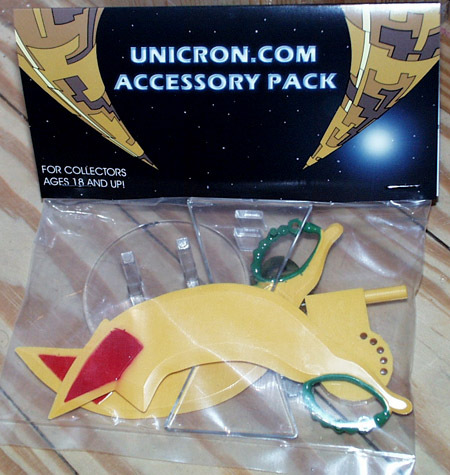 The Diagnostic Drone is what we had hoped to be the second Unicron.com Accessory Pack. 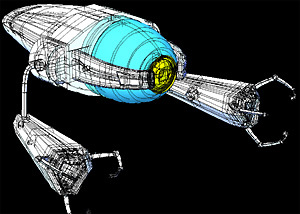 A small wire-mesh image showing the nearly-complete parts model is shown to the left. This picture may be small but it represents literally hundreds of hours of work, a collaboration of efforts by Aaron Thomas and myself. I'd design the parts by drawing up schematic sketches, required dimensions, etc... Aaron would make the 3D models that would become the actual parts of the drone toy. As you can see, each part's design is quite an evolution. We would start with basic concepts and work our way towards more and more difficult and specific requirements of the mold and parts making process. Shown to the right is a portion of an early sketch I sent Aaron which shows how the various parts of the drone "head" would fit together. 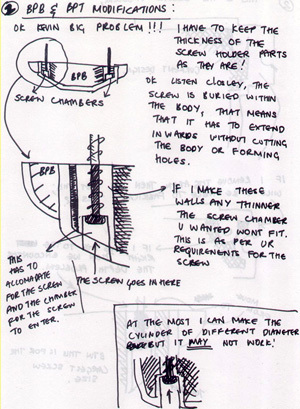 My sketches would of course be in 2D and Aaron would turn them into 3D models with very precise measurements and specifications. 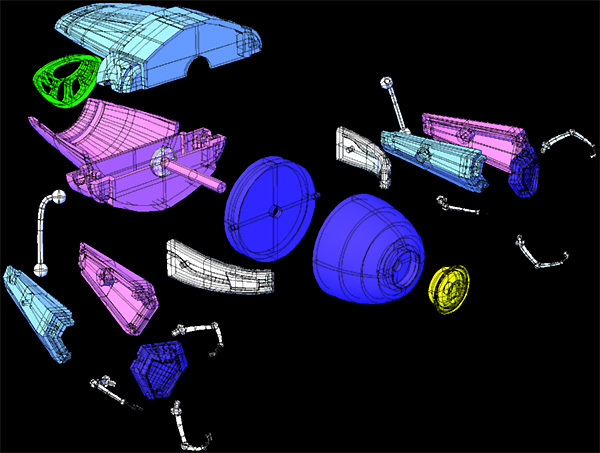 The picture to the left illustrates one of the first preliminary drafts of the drone "head" components. Many changes and revisions were made to this. 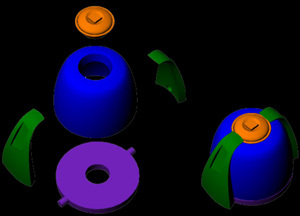 For instance, note how the "eye holders" (shown in green) get too thin at the tips, (injected molded parts can't to that!) the hole for the "eye rotator" (purple) had to be made much smaller diameter... You'd hardly believe how precise everything has to be! All things considered, the components of the drone head were a piece of cake! Next, we tackled the component parts of the drone's "body." I'm not going to bombard you with too many pictures illustrating our efforts (this page would get WAY too long!) 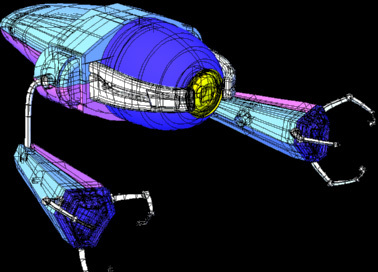 to create the drone's body top/bottom, arms, fore-arms, hand-face, fingers, exhaust "grill"... But, to give you an idea of the planning, sketching, modeling, editing and re-editing this type of project required, check out the picture to the right.. 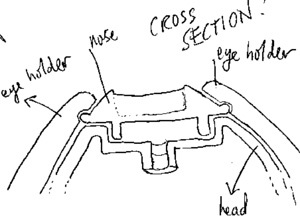 It's a sketch Aaron drew me illustrating a concern he had regarding the screw sockets which would hold the top and bottom halves of the drone's body together. It was nothing major. We resolved the issue quickly, but it gives you a small idea of the kind of back and forth correspondence we were having on a regular basis! The picture below shows how we intended it to all come together. It illustrates all of the drones component parts, except the articulating solar panels which were to be added later. Had these parts been built and brought together, they would have looked exactly as shown below. The only difference between what you see and what the part would look like, (other than the colors of the plastics) is that we would have added articulating 'solar-panels' and a ton of 'techno' detailing to the the body's top, bottom and each half of the fore-arms. As far as the colors go, it was our intent to match the plastics as closely as we could to the colors they were in the show. And as fun extra-feature, we were going to make the egg shaped head, 'eye- rotator' (shown in navy blue) and the exhaust grille (seen through the back end of the drone) a very bright vacuum metalized (Transmetal) BLUE. Uh, it would've been so sweet! 1.) Beast Machines wasn't as successful as we were hoping it would be. Based on our experience selling the first Accessory Pack, we learned that there are a surprising number of TF fans who just didn't want more Beast Mach stuff! What a bummer, because there are just SO many things in that show to make parts of. We also designed a Jetstorm stand, a drone stand... We even started designing a retro-fittable rotating laser cannon for the Mega-Tankor figure, we could've recolored the drone silver as the season 2 Megatron... We had all kinds of ideas for BMach accessories. 2.) Making parts is not cheap, and making this many parts is REALLY not cheap! It would have taken ~8-10 molds to build and a countless number of hours further to trim, paint, prepare... the parts and get them ready for assembly. The economics are that at the same price, we would've had to have sold 4 times more drones as we sold of the first pack to break even. Considering the popularity of Beast Machines right now, we think you'll understand our position that finishing off this project was not the fiscally right thing to do. Despite how much I wanted to make the Diagnostic Drone, we had to pull the plug. Now, the good news. None of this means we've given up. Work on what will be the second Unicron.com Accessory Pack has already begun. While we won't be announcing or selling anything at Botcon this year, we should have the second pack available in the not too distant future (3-6 months? if all goes according to plan). As internet sales have gone so well, it will probably be unveiled online as a 'net-only exclusive. Want details on what's to come? SORRY! You already know it will not be Beast Machines related and we want to keep some fun and suspense in this! Well, that's the latest! If you have any further questions, feel free to send them my way and I may put up an additional FAQ page. Thanks to all for your inquiries, patience and for continuing to check in and hang through with us!